On the 21st of December, a publicity event was organised at the Istanbul Military Museum with the collaboration of the museum management and TÜRSAB(Turkey Travel Agencies Association). With the aim to promote the museum to the tourism professionals, a guided tour by experts was followed by a cocktail at the Ahmet Muhtar Paşa Hall. At the start of the event TÜRSAB Principal Mr. Başaran Ulusoy, Museum Commander Colonel Albay Zafer and Head of ATASE (Military History, Strategical Study Department) Brigadier General Nejat Tuna each gave a speech. Afterwards, the guests accompanied Mr. Başaran and the commanders through the museum. Tirendâz Archery had been giving Turkish Archery presentations/demos twice weekly since June this year. Naturally several team members were present during the museum tour. 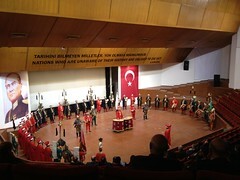 While Dr. Murat Özveri briefed the guests about the military aspects of Turkish Archery, Akın Öğretici enchanted the audience with a live demonstration and was subjected to many compliments. The team members attended the cocktail in their historical costumes and continued to answer questions regarding Tirendâz’ long term missions and talked about the museums archery presentations, a project which has been running for almost six months. Akın Öğretici and Emel Sarıpınar, who mainly shouldered the burden of this successful project as well as Gürcan Baysak and Ferhat Yöndemli, who also made immense contributions, sparkled in their costumes and archery tackle. Among invited guests were academics too. Tirendâz members Assistant Associate Professor Günhan Börekçi, Assistant Associate Professor Kahraman Şakül and our mutual friend Assistant Associate Professor Emrah Safâ were there as military historians. Well known art historian Professor Nuran Atasoy was also in attendance. We had the pleasure of talking to her and were lucky enough to get exposed to her immense knowledge. With more than 50,000 articles in its collection, the Istanbul Military Museum is one of the most important military museums in the world. We believe that this event was an important step towards getting the attention it deserves from tourism industry experts.